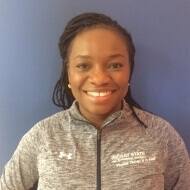 Bisi earned a Bachelors degree in Physiotherapy from the University of Ibadan, Oyo State, Nigeria 2001 and is a graduate of the University of Michigan, Flint Doctor of Physical Therapy Program in 2013. She earned a Clinical Concentration Certificate in Orthopedic Physical Therapy from the University of Michigan, Flint in 2014. She has experience in Sports and Orthopedic Physical Therapy and has worked with various National Sports teams in Nigeria including the National Female Soccer Team. She is happily married, God fearing and loves new experiences and is constantly seeking a good challenge.